What things do I need to consider when buying floorstanding speakers? There are basically four things you should take into consideration when shopping for floorstanding speakers. Space – How big is the room you plan to put these in? Floorstanding speakers can be impressive but in a small room sometimes they are too much. Audio quality suffers without a lot of room treatment. If you have a smaller sized room, something less than 8-10ft wide and 10-15ft long you may want to consider bookshelf speakers and a sub set up. Imaging can sometimes be better and room reflections can be mitigated by seating distance from 2-way near field bookshelf speakers. Speaking of sitting distance, with floorstanding speakers, you’ll want at least 8-10ft of distance between you and the speaker so that the sound from the tweeter and woofers has enough space to fully meld into one before it enters your ears. Of course, every speaker is a bit different, but this is a good rule of thumb distance for 3-way or more speakers.Â Sound image and quality can suffer if it hasn’t fully formed into one by the time it gets to you. With 2-way floorstanding speakers such as the Salk Songtowers, distance can be closer.Â You’ll also want to make sure your the speakers aren’t stuff into corners. Rather 2-3ft from them so bass doesn’t become BOOMing and overwhelming. But finding your best sweet spot is your own challenge.Â If you have the ability, and a dedicated rectangle listing room, try this Golden Triangle approach.Â It is what I use. Associated Equipment – You’ll want to make sure that your amp and input sources characteristics match your speaker characteristics for a desired result. For instance, if your amp is known to be bright, and you get speakers that are also known to be bright, the combo of the two can be over bearing and make listening unpleasant. If your pre-amp or tuner has high and low controls you can adjust for this. If they don’t, than it is a major part of pairing your equipment. Don’t forget to mitigate the associated equipment known as your listening room.Â Make sure to at least put sound dampening material at the points of 1st reflection and behind you if you can.Â Here is a good reference article on first reflections points from PSAudio.Â It is easy and can make a world of difference for soundstage. Home Theater or Stereo Only – If you plan to build up a home theater system at some point it is good to consider if the speakers you are purchasing have associated surrounds, center, and sub speakers paired with the floorstanding. In a surround sound system having matching sounding speakers is very important. Brent Butterworth, Sound + Vision, February/March 2011 – The Axiom Audio M60 v3 gave me the reliable engineering excellence I expect from the Canadian school. It also gave me something I didn’t anticipate: that extra dose of audio excitement I often hear in more exotic designs. Mike L., LA (customer comment) writes – I literally began to cry; I mean it! I have never heard sound that incredibly crystal clear, powerful, balanced, overwhelming. I was carried away to another place by the beauty spilling out of these awesome speakers. AudioEnz – Michael Wong – The Diamonds are the kind of product expected from a long time manufacturer dedicated to making music accessible. With it’s canny balance of abilities the Diamonds do a very good job of disappearing and do not get between the listener and the music. With no major flaws, they are a steal, solid proof that the art of building good value stereo equipment survives. Canada HIFI – Through my test, I discovered that the Energy C-Series are a set of very musical speakers with a sweet tooth for the home theatre. With their modest size, they can be easily accommodated into a smaller room, although their sound can effortlessly fill an average sized listening space. AudioReview - 5 Reviews 5.00 of 5 – mastermind717 writes – For the price these are the best speakers I have ever heard. Highs, lows and midrange are tight and accurate. The sound stage is full and pleasant to listen to for hours no matter what your taste in music. I am running the C-500′s without a sub though I’m certain a mid size velodyne would compliment these nicely, especially for movies. Goodsound.com – They’re so good that they’ll make you look like an audio wunderkind and make your system sing as never before. They do need to be driven by a good, strong receiver or amp — no 25W weaklings need apply — and they’ll expose weaknesses upstream from them (if you have a cheap, tinny-sounding CD player, for instance). They’ll also expose the intricate layers of beauty that might be hidden by your current speakers, so if you’re tempted to give ‘em a try, you can have these Maggies in your home for a 60-day, money-back trial. AudioReview - 283 Reviews 4.72 of 5 – stuartson writes – First off, The MMGs are amazing! Not simply “amazing for the money”, but flat out amazing. The soundstage is open and expansive, the tonal reproduction is exceptional, the speed and detail are mind-boggling at times. They truly have the ability to reproduce certain types of music with a scary accuracy and realism. AudioReview - DPS writes -I have had a pair of MMG’s for about six months and will most likely quit searching for the elusive audio nirvana I’ve been chasing since the mid 70′s. The simple fact is these speakers provide a window into my music tastes that cannot be duplicated by any other available speaker any where near this price. hometheaterreview.com – Soundstaging and imaging are both superb with the Monitor 7s. The Monitor 7s’ soundstage is as deep as it is wide and very nicely detailed and natural in its presentation. In terms of imaging, especially center focus, the Monitor 7s react much more like mini monitors than floor-standing loudspeakers. AudioReview - 98 Reviews 4.55 of 5 Spock1234 writes – This is especially obvious when listening to Jazz and Blues recordings which contain male voices and acoustic guitar segments. The bass extension is low enough to â€˜feelâ€™ the music, but it never sounds â€˜boomyâ€™. The single best thing about these speakers is that they are â€˜Neutralâ€™. If you are used to listening to other speakers that make the music sound â€˜shrillâ€™ or â€˜boomyâ€™, the Monitor 7s may sound a little â€˜flatâ€™ initially. But after you listen to them for a day or two, you will appreciate of the neutrality the Monitors. reviews.digitaltrends.com writes - The highs are sweet, the mids are richly detailed, and the bass is tight and accurate. Our only complaint is that the midrange could be a little richer on some vocal recordings. Additionally, the finish on these speakers left little to be desired in terms of a luxury finish â€“ but now knowing their true price, we feel this is almost an uncalled for assessment. Bestcovery.com – Polkâ€™s TSi500 floorstanding speakers are well designed with excellent build quality and finish for the money. The sound quality and especially the bass are very good. Music is lively with clean detail and highs. These speakers have a whopping four 6.5â€ drivers that deliver strong bass. The frequency range is rated at 28Hz-25kHz. They work well for both home theater and music listening. AudioReview - 2 Reviews 5.00 of 5 – pvsat writes – the best performance in the upper entry segment. I moved from a set of polk R300s to these and yes they make a huge difference in the sound. I feel the room shake during explosion and low bass sequences. They image very well..the image size increased about 2-3 times from the r300s when listening in 2 channel. Amazon.com reviewer Richard Hebbourn – Although I’ve heard quite a few good things about the ES1 speakers, I was still surprised by the amount of bass that comes through them. The highs are even better – each note is crisp and defined, and the sound fills my entire house. AudioReview - 9 Reviews 4.11 of 5 – writes – My lucky day! Awesome speakers when coupled with a sub for frequencies below 70Hz. I power them with a 120 watt per channel HK Stereo (yes I said stereo) reciever and run them through a 15 band equalizer just to tweak them ever so slightly. Add a 12 inch 150 watt sub and CD’s, Movies, and Concert DVD’s rock! Don’t let the fact they won’t cost ya an arm and a leg fool you, these may be the best deal in HiFi to be had in a long time! 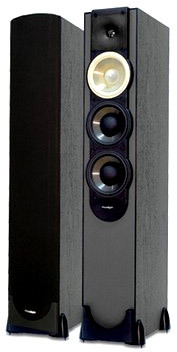 AudioReview - writes – First few weeks, these speakers were breaking in. They sounded distinctly harsh. After the break-in period, however, they REALLY smoothed out. I would highly recommend them as excellent value. They look good (my wife likes them) and they sound very good. AVguide.com – Few affordable systems offer a more compelling blend of detail, finesse, and dynamic clout plus an almost magically vibrant quality that brings music and movies alive. Bravo, Klipsch. AudioReview - 1 Reviews 5.00 of 5 -Â boorat writes – Amazing, crisp sound! Will wake the neighbors with no distortion. Crystal clear highs and smooth, tight punchy bass. I can hear every instrument on it’s own. My sound dream come true! Highly recommend these!! Not too big, not too small. My receiver is the DENON AVR 5700 (140 watts per channel). RG – AudioReview And they sound quite good to boot. If I was in the market for $1000 pair of speakers these would be a consideration – even for female vocals, classical, and jazz. Not perfect but nothing is and I like them better than than most for this money. 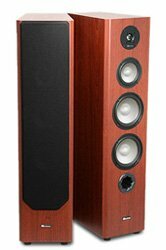 More Floorstanding speakers on AudioREVIEW. Yes, unfortunately, an Editorial list won’t, and probably couldn’t include everyone’s personal favorite speaker.Â So, if you think we left a great sub $1000 speaker out, comment. Let us and others know why you think it should be included.Â Help those in our community who are searching for speakers.Â Be detailed if you can about sound, music style, and room set up.Â It is great appreciated. Audio How To: What To Buy? - How To Set It Up? Nothing says awesome like great sound at 1/2 price! I auditioned most of the speakers on this list and found the EMP 5ti Impression towers to better them all in sound quality and aesthetics. I even placed these towers side by side with the Axiom M60s and preferred the EMPs. I got them on sale for $400/pair as they are normally $700/pair. The only gripe is they are a bit short but I bought outriggers to raise their height. Highly recommended. I purchased the POLK Monitor 70′s directly from POLK on ebay for 177 a pair! Thats right 177 a pair! They are the predecessor to the TSi500′s and let me tell you they will blow your hair back with a good amp or receiver! Why pay 700-800 when you can get the same speaker for between 150-250? A no brainer dude! You’re a smart guy… lots of times people will buy a much more expensive set of speakers just because they *think* they must sound better if they’re much more expensive. Anyway… Lucky you!! Congrats on your find. If you wanted to find another pair of Polk Monitor 70s or TSi500s (or similar) at that kind of price, where would you look?? Please let me know! I’m an audiophile with very expensive tastes who is on permanent disability, can no longer work, and has little money to spend on a much-needed new set of speakers. wow 177 per pair …. can you please give the site to order it also… been spending so much time searching on the net for a good deal … nothing compare to your. Please email me too …. jo.three@yahoo.com. Does anyone know much about Phase Technology speakers? I havent heard a lot of people talk about them, but they seem to get great ratings. I just bought a 63 inch samsung tv, and am thinking about getting some pc-1 speakers. Any thoughts or suggestions? How does the Klipsch rate better than the Monitor Audios. Are they deaf? I was OK with your rating on the Monitors. Then I read they scored the Klipsch at 5 of 5? Can I get a WTF? For those of you that dont know, its compairing a work of art to a turd. What about the PSB Alpha T1? It’s really worth considering. Phase technology use metal coated drivers (titanium deposited), so they have high SPL, excellent clarity and punch, the low mid and lows are really clear and precise. They’re best when provided with their maximum amp rating and they also look gorgeous without the grill. I recommend looking into the velocity series. Go with them! $177 a pair?!?!!? That is ridiculous! I am on a tight budget and would like to know where you got them for that at? Please email me if you can! The polks he’s talking can be found on Polks ebay direct store.. they currently just listed over 800 new home audio items. all items are refurbs that included a polk warranty. Yeeesss!!!! POLK Monitor 70â€™s directly from POLK on ebay for 177 a pair??? i want to know the site to order too. Please email me or post. these CV-215 just got major props from one of the more audiophile and $$$$$ users on the audioreview forums. they might be worth check out if you don’t mind the frat boy looks. there is a newer science called hyper definition that time corrects the chronoton time smear taking place when electrons flow through grid lock junctions,poor quality caps and coils as wellas pc boards !get that you are there performance at every playback and there is only one person pioneering this field.and dose it ever work ,it makes surround sound processors redundant.and draws the gap between analogue and digital togather! so matt paul henery !its time you move on! the new kids in townand he has some serious science /performance its about time!really! hes scaring the competition to death! listening to music is fun again!!! Don’t underestimate the floor standing Polk RTiA3′s. For $450.00, I believe they are the best value for little money. I love mine. I’m driving them with a RX797, and a Onkyo M282. The sound is fantastic. Just ordered the Monitor 70′s from newegg in Cherry. Thanks guys! 219 each right now. I love it. and they were very good. I liked them for their dynamic sound. They could really handle transients and large swings in the piece. They impressed me ALOT. They are made here in Jax too. Their flagship floor standers are only $3000. I wonder what those sound like!? “Huh”?… What?… Hyperdefenition sound for the newboysintown? Sounds like a bunch of CRAP! Most electronics are highly over priced and since sound is subjective, many people might be happy with something thats actualy affordable! Warm, bright, detailed, timesmear, imaging, soundstage, dynamics, and on and on. These are mainly selling words for high profit and it is such B.S.! I agree with better sound from high definition audio such as SACD or SADVD and as long as any speakers can reproduce it, they are all going to sound the same period! Unless of course your rooms acoustics are different and what most people should be worried about! Had the Bose Acoustimass 12 for 4 years and I thought it was the best thing. Then got Energy Take 5 classic which blew the Bose away. The acoustimas models are just not great for music. Then stepped up to Klipsch RF-62 with 2 6″ drivers and horn tweeters. The horns really make the difference. My brother had Polk monitor 60s and also had PSB T1. I still like the Klipsch because the horns make the music jump out at you. I’m more into jazz and musicals. Klipsch Horn loaded speakers are the way to go. Over half of the THX cinemas around the globe use them to play what was recorded accurately. I have a pair of RF-7′s, a RC-7 center channel, a pair of KS-525-THX Ultra 2 surrounds and a pair of RF-3 II’s for the rear. Driven by a Pioneer Elite reciever. Sure, you can rock the Casbah with these if you want, but the true Beauty is the clarity of woodwinds, horns and voice. The cast aluminum baskets on the woofers for the RF-7′s firmly hold their 90 ounce motors and produce sound below human hearing and the horns will reach above. 22 ounce neodymium motors ensure that the horns never distort. These speakers need only a fifth of the energy to drive them as compared to their peers. I use solid conductor silver cables in bi-wire for my surrounds and center and silver jumpers for the RF-7′s and RF-3 II’s. The silver conductors truly make a difference in the clarity. You can turn the amplifier WAY up and put your ear next to the largest horn and hear Golden Silence. Not a hiss of any kind. COOL LOOKING TOO!!! I encourage anyone who would like to own a world class system to listen to Klipsch at one of your Smart Friend’s house! How would people rate the MartinLogan Motion 12s in comparison to the speakers in this list. I’m very curious to know, as I’ve listened to them and was pretty impressed. Thoughts? KEF IQ9BL for 399/ea……. total steal at Amazon. 1500 worth of speakers for almost half price for the pair. Love Polk, looking at them for years. Great advise for a newbie like me, with not a lot to spend! Newegg.com has Polk Monitor 70 Series II for $179 ea, pair for $365.96 total. Monitor 60 series II (not quite the mid range) for $109 ea., total for a pair, S/H , no tax, $225. Sale on until Jan 25th only. Better than ebay right now. Cant find series I anymore, Thanks!. Now I need just need advise on newer power amp. No mention of the Axiom or Aperion line of floorstanders. What a diservice to all audiophiles. Just goes to show……. speakers are very PERSONEL!!! what one hears another does not..what one likes anothes does ‘nt……I prefer recording studio speakers like B&W’s and have owned thir top of the line many times…. but my Aurum Cantus Moon Goddess speakers provide the same accracey,SPL,FREQ. responce, and with the ribbon tweeters just a tad faster on transients….so thats why I have em…I LOVE EM! but you may not! Gr8 to read all reviews… as am new to this subject can any one please suggest what speakers to buy with Yamaha 367 Rx..am looking to pick up all five i.e Front Floor standing , a centre with woofer & two rear bookshelf r rear channel…wld appreciate your response..
Hard to judge based off no price points given – but you could look at BIC America home theater speakers – or for a bit more both in price and better sound would be something from Axiom – but really depends on who much you want to spend. If you like a smooth warmer sound you could look at Polk. Axiom and BIC would be open and airy and Polk will give you more warmth. Just depends on your ears. You have not considered sub $1,000 by a great many of the world’s most respected loudspeaker producers (Monitor Audio, B&W, KEF, Tannoy to name just a few), yet you include the likes of Fluance and Cerwin Vega. How can this article be at all authoritative? Recently purchased a pair of PolkAudio R60′s for $228/pair! Bought them on line at VISIONS CANADA. Cannot say enough about the sound and power these output. Extremely superb set of speakers although now discontinued. But a salesperson at VISIONS CANADA(in store), told me they have access to ample sets of these speakers. I say watch for the Annual Boxing Day Blitz and grab them then.